Imagine a place where strong African culture meets modern urban life, where years of troubled history gave way to cosmopolitan regeneration and where millions of inhabitants strive to upkeep one of the cleanest and safest cities in the world; add a pioneering convention centre like the Kigali Convention Centre (KCC); and all that surrounded and protected by green hillsides. That is Kigali, the capital of Rwanda, the ‘land of a thousand hills’, located in the central-east part of Africa. Years of government and private investing, aided by the people’s ‘Umuganda’community-oriented spirit, have produced a secure, spotless environment with an upcoming economy in sectors like tourism, services, mining and agriculture. The city’s spike-like road network provides good connections to the rest of the country whereas local public transportation is modernising and runs smoothly. Infrastructure development is evident throughout the city with facilities covering all types of events. New hotels pop out at constant pace with plans of big chains investing in the city,summing up actually to more than 2,600 hotel rooms. The Central Business District, in particular, is home to numerous hotels ranging all prices and categories. As accommodation is expanding, so is international connectivity; due for completion in 2020, a new airport will network the country further with the world. Established in 2014, the Rwanda Convention Bureau and its innovative leadership has been of fundamental importance in the promotion of Kigali as a meetings destination.Its services go beyond mere publicity for the city; it provides guidance and personalised solutions for the unique needs of associations, such as engaging with government and private sector specialists in supporting events. As a result, Kigali reached third place in the ICCA 2017 Africa rankings and has proven to be a major player in the business events industry over the past few years, with conferences such as the Africa Green Revolution Forum (AGRF) and the Transform Africa Summit just this past year portraying the city’s ability to receive such heavyweight events. 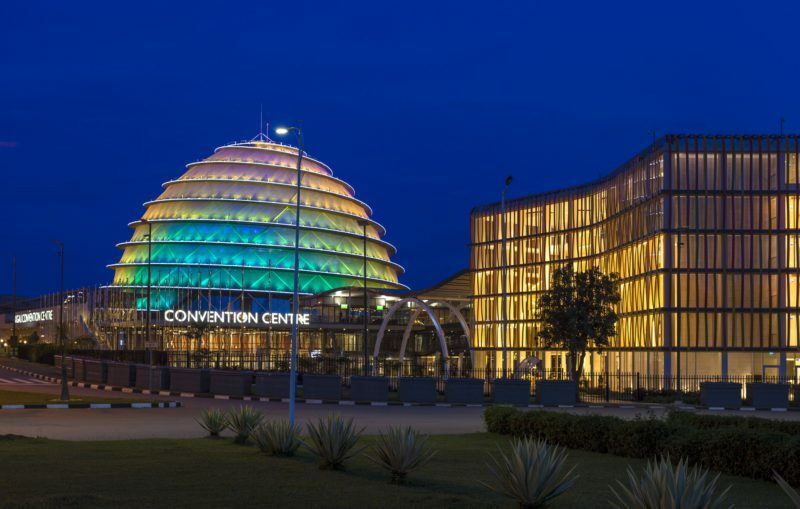 Conferences of this calibre could only be held at pioneering facilities such as the Kigali Convention Centre (KCC), the country’s biggest and newest events venue, located in the heart of Kigali, five kilometres in proximity to the bustling city centre but as well Kigali International Airport. Officially launched in July 2016, KCC has definitely made an impact on the city, both aesthetically and financially. Its dome-shape exterior, resembling a traditional Rwandan King’s palace, attracts attention as much on the outside with its light show as on the inside with its functional spaces. Eighteen different venues and an auditorium of 2,600 attendee’s capacity are what makes this centre adept for any kind of conference. Nagen Naidu, KCC Director of Convention, comments on the Centre’s work: “With the highest standards in East Africa, advanced technology and offers, KCC’s occupancy grows substantially every year and 2019 follows this trend. The full version of this article, written by Boardroom Editor Vicky Koffa, is available in the February issue of Boardroom available here.